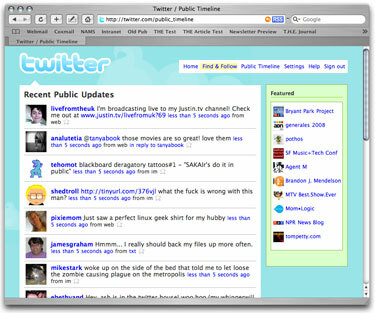 Twitter is a software tool that allows users to continually post (or "tweet") very short text messages to the Web from computers or mobile phones. These quick public messages simply describe what a user is currently doing. Twitter's appeal has mushroomed, making it a much-discussed new technology and highly popular with 18- to-25-year-old users. Depending on your point of view, Twitter is either a cool new way to connect or yet more online noise. But Twitter as an academic tool? In this interview, we talk with David Parry, assistant professor of Emerging Media at the University of Texas at Dallas, who recently blogged about using Twitter in class. Linda Briggs: I've registered with Twitter and poked around a bit, and it's fun, but I'm not sure I see the academic value. David Parry: I'll say two things about Twitter in academia. One, its uses in academia parallel its uses in the business world. It's a networking, water-cooler-talk kind of environment, where you don't see people every day, but you feel connected because you get updates on what they are doing in their life every day. Also, it's a mixture of the insightful plus the mundane. So students will send me "I am looking for rain boots" or "I am going to meet someone at a coffee shop to buy something that I just bought on craigslist" along with the insightful, where they'll say something like, "Oh, I saw this news article on TV that relates to what we talked about in class." But is has to be both of those things for Twitter to really work. Briggs: So it's important to have the mundane along with the insightful? And you do find that students really are posting some insightful things? Parry: Yes. Students use it as a way to talk about their classes. Often, the chatter will turn to talking about their schoolwork because that forms so much of what their life is about. But also, it gives me a sense--and I think it gives the students a sense--of what a person is like outside of the classroom. Knowing that substantially changes the dynamics of what goes on inside the classroom. I think people end up being a lot more comfortable with classroom discourse and get a sense that [the instructor] isn't just someone who comes in and talks for an hour and 30 minutes twice a week. It has the very positive effect of altering the classroom state to not just be contained by the four walls, and by meeting twice a week. Briggs: So students get to know you better, and they get to know each other better outside the classroom? Parry: Yes, but ... it's not some sort of kum-ba-ya, touchie-feelie thing. It's ... really hard to describe without doing it, but you get this sort of sixth sense of the fact that there are other people out there in the world to whom you are connected, who are doing things all the time. And you get a sense of what they're doing. The people who are most valuable for me to follow in Twitter are either the people who are relevant in the field--I follow Howard Rheingold, who wrote Smart Mobs, and Dave Weiner--plus following the people who I see maybe once a week. Following my grad students, for example.... When I see them on Monday, I don't feel like I'm just seeing them on Monday. I have a sense of what they've been doing between class times. And that's when Twitter becomes really valuable, and when I think you start to see it's most significant value--when you're following people that you know, but who you don't see enough to build the close relationship you really need. Briggs: Sometimes I think we overestimate how heavily students are using these new technologies. What has student reaction to your use of Twitter been? Parry: As a caveat, I should say that I teach in a program called arts and technology, so the students I'm dealing with are not only tech-savyy, but they're really smart. Most of them have laptops that they bring to class. A lot know how to do coding and programming, and they also have an artistic side. So it's heavily skewed in my favor. 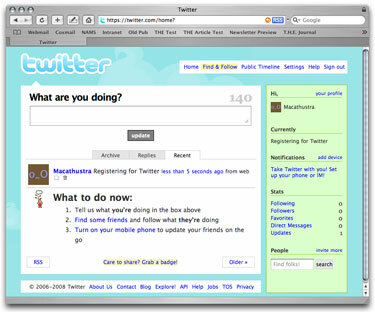 I would say that of all the things I did [during the fall when I introduced Twitter]--including blogs, Wikipedia ... a whole range of new technologies--it was by far the class favorite. It was most often mentioned on course evaluations, and it's also the one that stuck the most. Out of a class of 20, there are five who heavily use Twitter and five who occasionally use Twitter. So we're talking 50 percent who still use it.... So in that sense, it was well received by students. Also, one of the things I was trying to teach in that class was [that] it's not about the nodes in the network; it's about the connections you can form between information. So a single blog post doesn't do you any good; it's the blog post connected to another blog post that creates the network. Parry: Right. I was having a hard time getting them to realize that.... I think they got it on a theoretical level, but they really weren't seeing the practical implication of it. Once we used Twitter, there were a couple of key moments in the first week. Someone had a question, and they would Twitter, whether it was related to class or not.... My own personal example was, recently I was buying a new computer monitor, and I Twittered, "What should I buy?" Four of my students responded: "Here's a bunch of research I did," and, "Here's my recommendation," all with links. Briggs: What kinds of reactions did you get to your blog about ways to use Twitter academically? It seems to have garnered lots of attention. Parry: It was mostly positive.... A lot of people built on my post in terms of, "Oh, here are some things you haven't thought of." People came up with some interesting uses, in particular about teaching large lecture classes, which I've never taught. And some were skeptical and critical: "I don't want to keep up with what my students are doing when class is over...." So I respond, well, then don't. But for me it's an effective teaching tool that can change the rules of the classroom. So I'm going to continue to use it. Briggs: What are some of the ways that you've found Twitter useful in the classroom, and what are some of the benefits? Parry: The biggest benefit is the one I've already mentioned--the way it changes classroom dynamics. The second would be the way that it can serve both as a means of analysis and an object of analysis, especially in a media studies type of class. In the rest of the [blog] post, I've been collecting ideas that I or different people had about some of the more practical uses of Twitter. So the third most interesting way to use Twitter is maybe this: We're always trying to teach students, especially in writing, that context determines meaning. And because Twitter has very refined rules about what you can do--only 140 characters, for example--it's developed its own sort of discursive grammar set; that can serve as an example of how rules can be productive for communication and can limit communication. Briggs: As Twitter gains ground, do you think we'll be seeing more Twitter participants with some real substance, such as "Newmediajim?" Parry: "Newmediajim" is one of the people I tell students to follow first in Twitter. He's a cameraman for NBC. He often gets to work wherever President Bush is traveling; right now he's in Africa. He's a marquee example of how mixing the mundane with the relevant gives people more insight into what's really going on. I have a much clearer picture, from following him, of what it means to be on Air Force One and create a shot and camera pools and all this other journalistic stuff.... You get a sense of him as a whole person. The same cycle that we saw with blogs, where at first they were just personal live journals with no social value ... we've seen that in Twitter. "I'm going out for a sandwich," or, "I'm going out for lunch." But now the tech community is figuring out how to use this different form of communication to create different publics and to do other interesting things with it.